"Pretty self explanatory. It creates a new camera based on the currect perspective view." This is a 3dsMax previsualization tool. It allows you to jump cameras and time to previs scenes. Simple script for VRay & PhysicalCameras management in your scene. Camera Import Export tool. This script makes possible camera transfer between MAYA MAX and LIGHTWAVE. Suported properties are Position, Orientation, Lens, Render W/H, FilmBack, Aspect ratios. Final result is 100% match in render image. Camera is with preserved time and mesurment UNITS, Corect Up axis. Now The final release is done (i hope). I did 2 versions of the script, furst is constrain based transfer (motion blur and gimble lock issue), other version is rotation based. Both do the same. Photo Studio Pro (PS Pro) is a photographic exposure control tool for computer generated images. Since 3dsmax2016 physical camera is supported and new perspektive and DOF functions. The interface is designed to manage your exposure output. 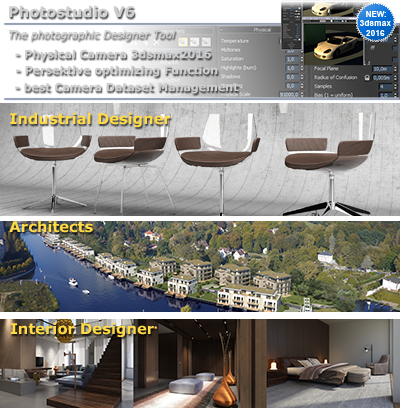 PSPro has some very special features like: realtime exposure or the simulation of the Av/Tv mode of a SLR camera.